After years of planning and restoration, the Scottsboro Depot Museum opened its doors in the summer of 2012. Browse our timeline describing the depot's restoration. Our new museum has attracted a lot of welcome attention. We have been encouraged by the our community's support and by the enthusiastic involvement of donors, volunteers and the local press. A new historical marker was installed outside the Scottsboro Depot Museum on Friday, August 9, offering an overview of the Union occupation of the town in the latter years of the Civil War. In late December, 1863,Union Maj.-Gen. John A. Logan establised his fifteenth Army Corps headquarters in Scottsboro, Alabama. On January 11, 1864, by the command of Gen. Logan, Brig. Gen. Hugh Ewing, commanding the Fourth Division, was ordered to guard the railroad and telegraph line from Scottsboro to Stevenson. 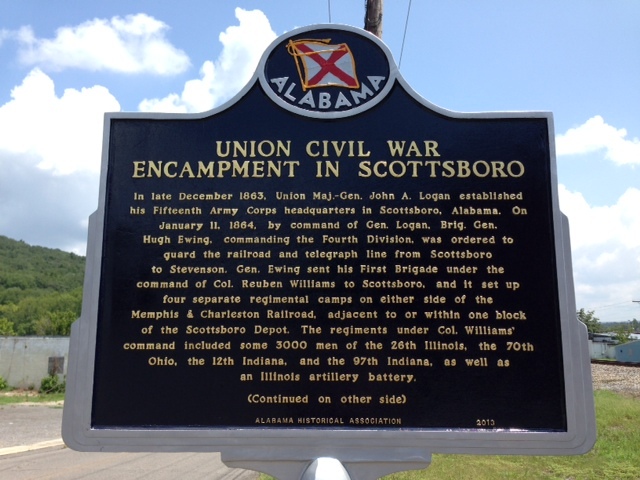 Gen. Ewing sent his first brigade under the command of Col. Reuben Williams to Scottsboro, and it set up four separate regimental camps on either side of the Memphis & Charleton Railroad adjacent to or within one block of the Scottsboro Depot. The regiments under Col. Williams' command included some 3000 men of the 26t Illinois, the 70th Ohio, the 12th Indiana, and the 97th Indiana, as well as an Illinois artillery battery. After the war, Col. Williams returned to Indiana and establised the Warsaw Daily Times. In his 1904 Civil War memoir, he included an in-depth description of the facilities created within the Scottsboro encampment and his troops' military and social activities between December 26, 1863 and May 1, 1864. In the early Spring of 1864, Col. Williams coodinated a successful dance in a building located on Main Street (now Maple Ave.) that served as Scottsboro's first school and church. He wrote that he site was "large enough for the waltz and gavotte." 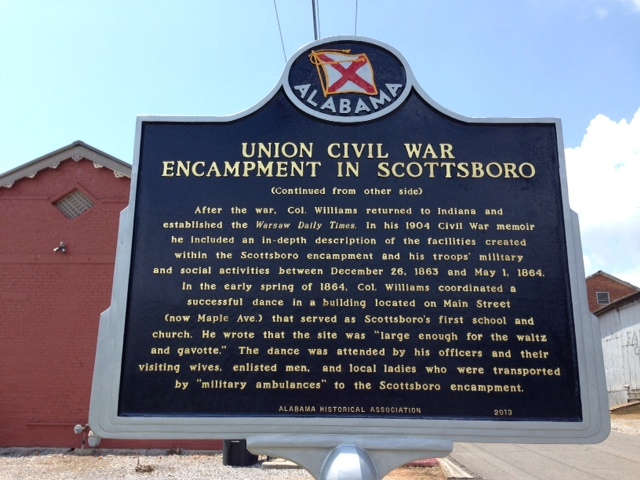 The dance was attended by his officers and their visiting wives, enlisted men, and local ladies who were transported by "military ambulances" to the Scottsboro encampment. Scottsboro artist Clyde Broadway has painted and sketched numerous Jackson County landmarks over the last few decades. His sketches of historic Bellefonte and Scottsboro have increased significantly in value since the sale of his limited editions. Now, Clyde-who has been a central part of our restoration-has focused his talent on the Scottsboro Depot Museum. 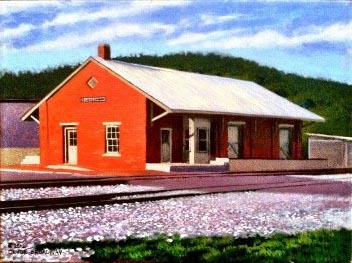 Clyde's painting is frequently exhibited at the Depot Museum. Right now, you can see more of Clyde's recent work on his Facebook Page.